Can employers regulate employees' off-duty conduct? Would You Take the Bait in a Phishing Scam? Federal judge strikes down gay marriage ban in Michigan. That’s 18 states plus DC. Hefty costs bill for woman who sued divorce lawyer after disregarding the lawyer's advice. Are pre-contractual representations “continuing”? Even if the contracting parties change? Is Going Solo The Best Choice For Parents Who Practice Law? The Internet Is 25: How Do We Keep It Open and Free? What did you learn from your legal mentor? And mentors, what have you learned from your mentees? American courtroom dramas and John Grisham novels tend to skew Canadian views on what punitive damages are and how they are awarded. Pate Estate v. Galway-Cavendish and Harvey (Township) provides some clarity on the awarding of punitive damages in the employment law context. The Ontario Human Rights Tribunal has ordered National Money Mart Company to pay $30,000 in compensation to a former, one-year employee of the company who had been subjected to ongoing, serious sexual harassment by her workplace supervisor. Workplace bullying is a serious problem for thousands of Canadians at work. It can degrade one’s self worth and create serious health problems for workers and their families. There has often been very little that could be done to stop the workplace bully in his or her tracks. But, in Ontario, there is now hope around the corner. With the Ontario Court of Appeal's June 25, 2009 ruling in Slepenkova v. Ivanov, it is now clear that the nearly-universal pronouncements by management lawyers as to the death of Wallace damages after Honda and Keays may have been a bit premature. In Slepenkova, the Ontario appellate court upheld a two-month notice extension for an employer's bad faith termination, even though no evidence was led at trial as to the specific damages the employee directly incurred as a result of the bad faith. This appeared to place the trial Judge's decision at odds with the new Wallace test set out in Honda. Bill 133, Ontario's Family Statute Law Amendment Act, 2009, was carried in its Third Reading on May 7, 2009. The Bill enacts significant amendments to Ontario's family law regime. Parental Access Visits via Skype? Should access visitation with children via Skpe be considered an acceptable substitute where a custodial parent wants to move far away with the family's children? Canada's family courts have reached conflicting decisions on this challenging new issue of the digital age. Canada's press has had a field day with four sensational cases that have been winding their way through the nation's courts. Dealing with fundamental questions at the very root of our values around marriage, children and family, these cases have captured the public's collective imagination - and ire -for very good reason. Wise Law Blog features timely articles on legal developments in Canada and the United States, along with commentary on Canadian politics, American politics, technology and noteworthy current affairs. 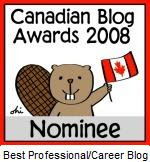 Launched on April 5, 2005, Wise Law Blog also highlights key decisions of Canadian courts, with focus on Ontario Family Law, Ontario Employment Law and other areas of interest. Garry J. Wise is primary contributor to Wise Law Blog. 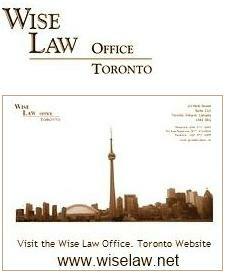 He is a Canadian litigation lawyer who practices with Wise Law Office,Toronto. He is a graduate of Osgoode Hall Law School and was called to the Ontario Bar in 1986. 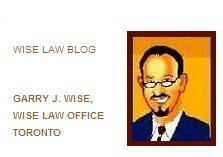 Garry's colleagues at Wise Law Office, as well as occasional guest bloggers, also contribute to Wise Law Blog. The articles and comments on Wise Law Blog are intended to provide general information on current issues and developments in the law. They are not intended to provide legal advice. Readers should not rely upon or act on information in this, or any blog without seeking legal advice as to the matters of specific concern to them. No solicitor and client relationship is created or can be created by accessing, reading or commenting upon any post at this site. Wise Law Blog is not responsible for and does not necessarily agree with the contents of comments posted by readers of this blog. Such comments represent the personal views of the commenters only, and are included on this blog in the interest of promoting public discourse and a free exchange of ideas. We reserve the right to decline or delete any comment posted on this site which we, in our sole and absolute discretion, deem inappropriate for publication on this site. Wise Law Blog, (c)2005-2010 Garry J. Wise and Wise Law Office, Toronto. All rights are reserved. Permission for reproduction and/or republication of any portion of this publication for solely non-commercial purposes is hereby granted provided any such non-commercial use shall include: (a) credit to the original author(s) thereof; (b) printable, embedded hyperlink to original Wise Law Blog post url. Reproduction and republication of any portion of this publication for commercial purposes is expressly prohibited without the permission in writing of the author(s).